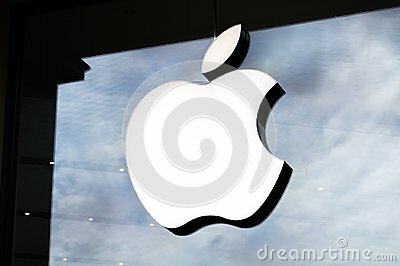 Logo of Apple Inc. on a Apple store. Apple is the multinational technology company headquartered in Cupertino, California. Barcelona, Spain - June 7, 2018: Logo of Apple Inc. on a Apple store. Apple is the multinational technology company headquartered in Cupertino, California and sells consumer electronics products.